Our very own Nigerian born British boxer, Anthony Joshua is the latest cover star for the famous 'Bible of Boxing' Ring Magazine. 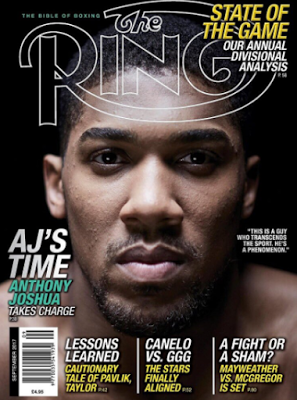 Joshua in the latest edition of the US based magazine Ring, speaks on his rise in the boxing world and other issues. Ring Magazine was founded by Nathaniel Fleischer in 1922 and it is the oldest U.S based boxing publication.